Enhance your experience of Frida Kahlo and Diego Rivera by joining us on May 2, 2017 for a limited members-only trip to Tucson to view Frida Kahlo: Art, Garden, Life at the Tucson Botanical Gardens. Prepare to transport yourself to Frida and Diego’s garden at la Casa Azul in Mexico City with this unique horticultural installation. Created, and originally exhibited by the New York Botanical Garden, Frida Kahlo: Art, Garden, Life is the first to ever focus on Kahlo’s engagement with nature, revealing her intense interest, aesthetic appreciation and deep knowledge of the natural world, especially Mexico’s plant life. Lunch will be generously hosted by Dino and Elizabeth Murfee DeConcini, a Heard Museum trustee. Nestled in the Blenman-Elm neighborhood, you will be treated to a tour of their historic adobe home and their collection of American Indian art, textiles and baskets. You will conclude the day with a tour of the Arizona State Museum’s new permanent exhibition, Woven Through Time: American Treasures of Native Basketry and Fiber Art and state-of-the-art conservation lab. Established in 1893, the Arizona State Museum is the oldest and largest anthropology museum in the region focusing on the indigenous cultures of the US Southwest and northern Mexico. Please meet at the Heard Museum no later than 7:30 a.m. Our bus will leave at 8 a.m. Ample rest stops will be made throughout the day. We will then return to the museum no later than 7 p.m. Lunch, snacks refreshments and travel accommodations are included in the registration fee. Space is limited to the first 30 participants so please contact Allison Lester, Membership Manager to reserve you seat. Call 602.251.0262 or email alester@heard.org. 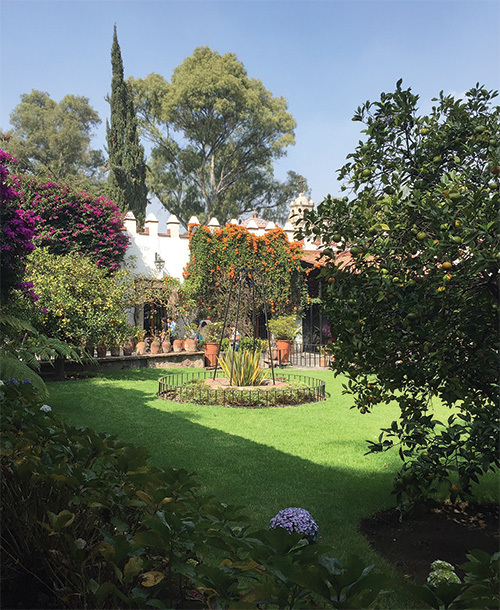 Garden at la Casa Azul, Mexico City. Photo by John Bulla.